Braised beef tacos take on incredible flavor using a unique chile rub before a long slow cook in the oven. A few simple ingredients create a thick rich sauce to mix with the beef after shredding. This is an exciting flavored shredded beef taco recipe that makes the best beef street tacos ever. Let’s take a look. I’m not claiming that these braised beef tacos are authentic Mexican Street Tacos. Carne Asada will always be king in that arena. The simplicity of fresh-flavored sliced flank or skirt steak in a small taco shell that will fit in the palm of your hand equals street taco perfection. However, I am claiming that you’ll be amazed at the flavor this recipe delivers. Starting with the humble pot roast and seasoning it with a not so humble spice rub will deliver you shredded beef tacos that will WOW those taste buds. And using street sized tortillas make this a delightful way to serve up Mexican flavors. Mission brand tortillas makes both street taco flour and corn tortillas. They are readily available in our markets here in Colorado and I hope you’ll find the same true in your area. We really liked using the flour taco shells for this recipe. The sturdy texture and sweeter flavor seemed perfect. I should really call these New Mexico Beef Tacos. The spice rub for the pot roast consists of an ample amount of New Mexico Red Chile Powder, preferably Chimayo, brown sugar and the usual line up of Southwestern spices such as Mexican Oregano and cumin. It all comes together beautifully. I’ve made this recipe several times, to get the seasonings and cook time just right, and not once have I followed the golden rule to sear the beef before braising. I feel the raw meat acts like a sponge for the chile rub. Simply purchase a two-ish pound chuck roast and trim any big amounts of fat off the meat. The last two roasts I purchased didn’t need much trimming at all. Rub the meat with the spice rub and let it sit in the refrigerator for an hour or so. Remove the chuck roast from the refrigerator and let it sit at room temperature for about thirty minutes. Preheat the oven to 300 degrees. 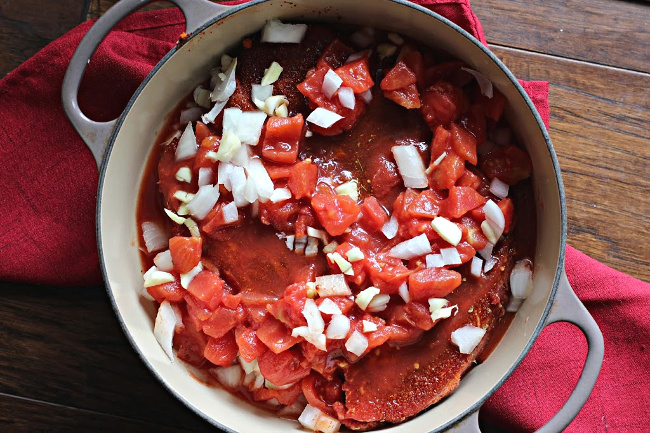 Pour a can of diced tomatoes over the beef, add the chopped onion and let it braise for 2.5 to 3 hours, or until the meat shreds easily with forks. 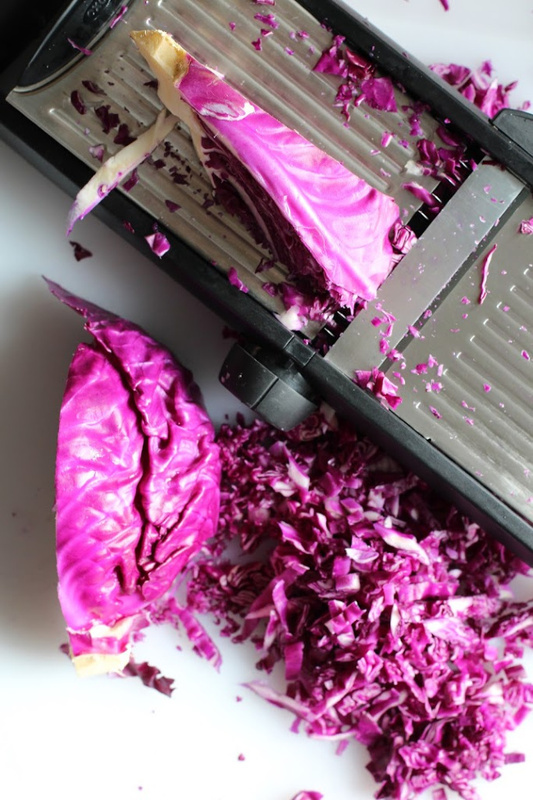 While the beef is cooking, you’ll have plenty of time to slice and dice the ingredients for this red cabbage slaw. 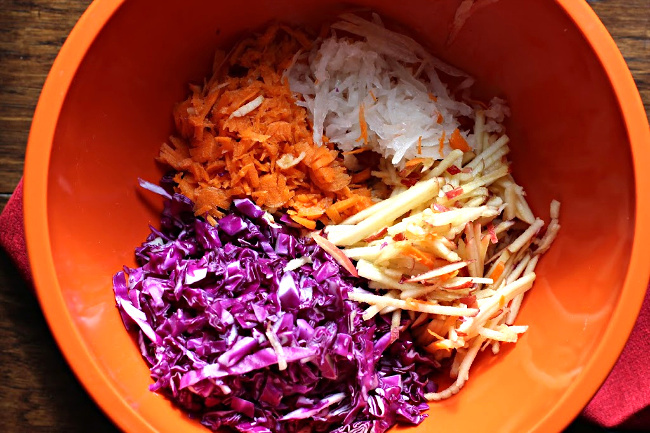 Beautiful in color with red cabbage and carrot and snappy in flavor with sweet apple and onion. This tangy red cabbage slaw is a wonderful compliment to these spicy beef street tacos and would be a perfect partner for any taco, including chicken or pork varieties. A mandolin will offer a speedy solution to slice and shred those ingredients into even pieces. This means not only an attractive end product, but accurate same-sized pieces help the flavors to blend. I’ve had my OXO mandolin for years, and honestly, it’s one of those gadgets that has proven itself a kitchen workhorse. I use it often and it works beautifully. It’s sturdy and easy to use. And the blades have stayed sharp. It shreds, it slices and I love it. I’ve included an affiliate link if you’re interested in checking it out. That means if you purchase the mandolin through this link, I get a small commission at no extra charge to you. This may be the best shredded beef tacos recipe I’ve ever made. It’s one of those combinations that requires the whole package to appreciate the brilliance of the flavors. The whole package meaning the red cabbage slaw and the flavors in the beef are a match made in culinary heaven. The warmth and spice of the New Mexico Chile powder when combined brown sugar and Mexican Oregano blends beautifully with chopped tomatoes and onions. The end result is a sauce that holds the shredded beef together for a a stunning treat. 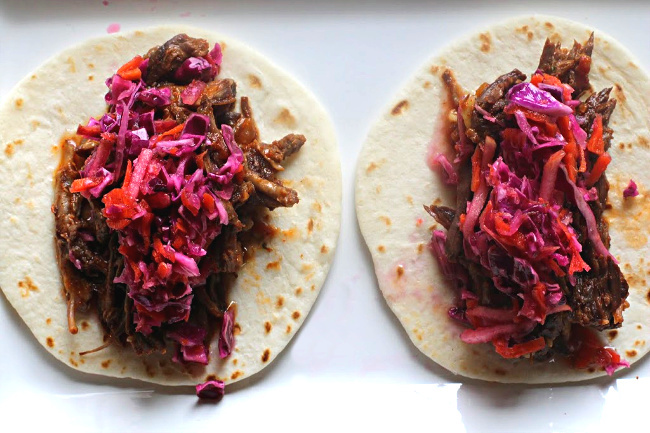 Topped with a sweet and savory cabbage slaw and you’ve got a great taco. I hope you give these beef street tacos a try and if you do, please come back and give the recipe a star rating. And if you have a favorite shredded beef tacos recipe, let me know, I’d love to give it a try. Coat the meat all over with the rub, and rub it in all over the meat. Put the meat in a Dutch oven or an oven proof high-sided skillet with a lid . Cover and refrigerate for 1 hour. Remove the meat from the refrigerator and let sit at room temperature for 1 hour before cooking. Leaving the liquid and vegetables in the pot, transfer the meat to a large cutting board. When cool enough, shred meat, discarding fat. Return the meat to the pot and mix in with the braising sauce. To make the slaw. Using a mandolin or sharp knife, shred the vegetables and the apple. In a large bowl, mix all ingredients together. Serve on tacos topped with slaw on flour street taco shells. These sound great LeaAnn as did all of your quarterly favorites. I love to have all kinds of braised meats in the fridge because they always make a great meal. Ditto for these tacos! Now those are some tacos!!! 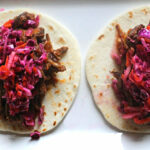 Love the braised beef, the pickled red cabbage and combining them into a taco! I’m sure they are as delicious as they look. In reference to the mandolin, I’ve had one for years and have maybe used it twice. Might have to pull it out and give it another go. I love using cabbage in tacos (and other Mexican dishes, for that matter). Usually use green cabbage — definitely need to give red a try. Love its color! 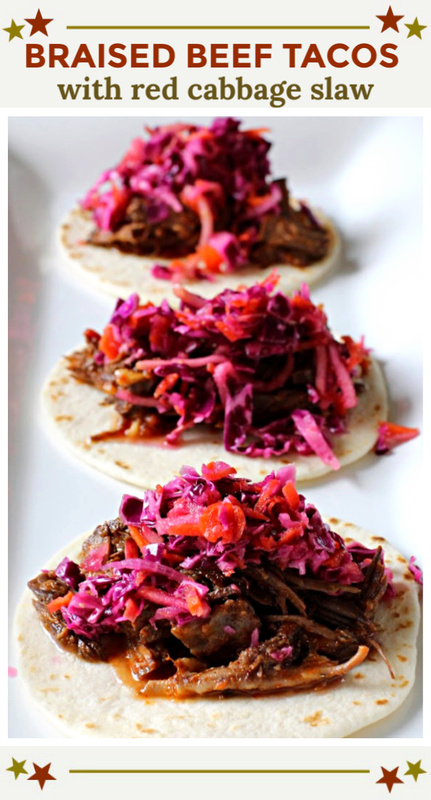 Those certainly aren’t your average tacos…love all the color of using the red cabbage. That cabbage slaw is he bomb. Lea Ann, this is a showstopper! I’ll be making this very soon! PS I didn’t buy a mandoline slicer today, but I did start my Amazon shopping through your link so that you will get a commission on my purchases. You’re just the best Jean. I’ll do the same for you.